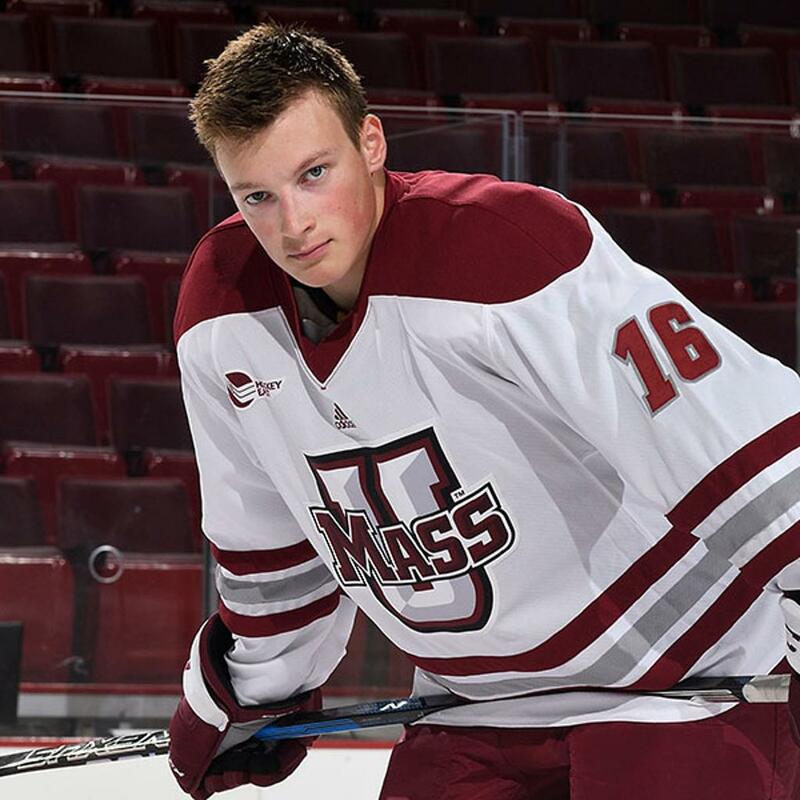 Hobey Baker Memorial Award Committee announced today the 2019 recipient of college hockey’s top individual prize is Cale Makar (mah-Car)from the University of Massachusetts. The announcement came during the NCAA Frozen Four championship in a live ceremony held at HarborCenter in Buffalo, New York and televised nationally on NHL Network. The sophomore defenseman from Calgary, Alberta becomes the first Hobey Baker winner from UMass. Makar’s prowess on the blue line helped guide the Minutemen to three program firsts: a Hockey East regular season championship, their first ever number one national ranking and their first trip to the NCAA Frozen Four. Known as a dynamic player, equally effective at both ends of the ice; he was named Hockey East Player of the Year and First Team all-conference, becoming the circuit’s first defenseman in 20 years to lead Hockey East in scoring. Accepting the 2019 Hobey Baker Memorial Award, Cale Maker of UMASS from Tom Hauser the 2018-2019 Committee Chair. 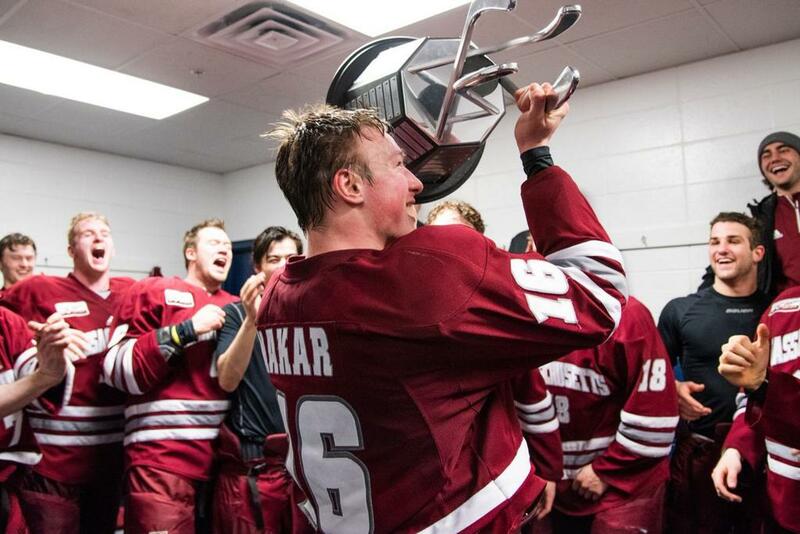 Makar helped UMass to their first ever national championship game with a thrilling 4-3 overtime win over Denver in Thursday’s NCAA semi-final game. On the season, Makar has 16 goals and 33 assists for 49 points in 40 games played. He is third in the nation in points, tops amongst all defensemen and just one point back of the national lead. An elite skating, offensive-minded blue-liner, he is also third in the nation in assists. His attention to details in all three zones has led to a plus/minus of +33, which is second amongst all college hockey players. The Minuteman assistant captain also contributed 15 points on the power play. As a freshman, Makar chipped in with 21 points in 34 games making the Hockey East All-Rookie team. He also skated in the 2018 IIHF World Junior Championship helping Canada to a Gold Medal. This followed a brilliant two-year junior career where he bagged 135 career points in 111 games, helping the Brooks Bandits of the Alberta Junior Hockey League to a pair of league championships, and he became the first two-time RBC Cup MVP. A 2017 first round (4thoverall) draft pick of the Colorado Avalanche, Makar is a sport management major. Cale participated in a variety of UMass community events including the town of Amherst block party, visiting elementary schools and post-game skates with UMass hockey fans. Hobey Baker was the legendary Princeton (1914) hockey player known as America’s greatest amateur athlete one hundred years ago. He redefined how the game was played with his coast-to-coast dashes in an era when hockey was contested by seven players and no forward passes. Baker, a member of the U.S. Army’s Air Corp, died testing a repaired aircraft at the end of World War I after he had completed his military service. The Hobey Baker Award criteria includes: displaying outstanding skills in all phases of the game, strength of character on and off the ice, sportsmanship and scholastic achievements. Makar was selected from a group of ten finalists by a 29-member selection committee and online fan balloting.